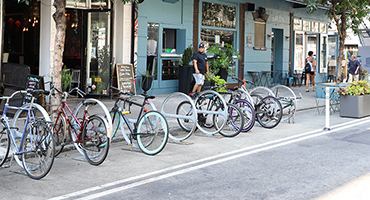 Bike corrals are rows of CityRacks installed in the curbside lane of the street instead of on the sidewalk. This design is a great solution for places where demand for bicycle parking outstrips the available sidewalk space. Anyone can request a bike corral but every bike corral needs a maintenance partner to keep the bike corral clear of snow and debris.